It’s interesting what we might be able to surmise from a culture based on a very simple choice that citizens make on a daily basis. Today on my way home from the grocery store, I was forced to think back on something I had read online by a German in regards to the German attitude towards “jaywalking”. She discussed that most people don’t do it, and that, in her case, while we may assume it’s because of the stereotypes regarding Germans as being orderly and following rules, it’s actually because she was taught that jaywalking could give younger children a bad impression and thus put them in danger of imitating the act at the wrong time. (I have yet to be able to discuss this with any Germans I know though, so perhaps this is completely off-beat altogether). It was explained that it’s simply best to lead children by example, and that in the long run, it’s simply safer for everyone not to take the risk, and becomes internalized as something not to do. In France however, this does not seem to be the case. The law stipulates that, “drivers must always stop if a pedestrian is crossing or showing the intention to, anywhere along a road, including outside a zebra crossing or pedestrian zone,” which is pretty darn convenient, especially since the driver is at fault if they hit you (according to Wikipedia). As a foreigner, I can definitely say from experience that it is nice to know that you can trust drivers to stop (see RR #5), especially come from a “car-culture” in Canada where being a pedestrian feels second-class. A feeling that makes me despise crossing the street at crosswalks back home (where I once literally had to jump out of the way of a car despite having the right-of-way). Back to my story! So, I’m laden down with groceries and am at a sectioned crosswalk. I cross the first road, and as I approach the second, the lights change and I stop beside an old woman and a young boy to wait for cars to pass. The woman is holding the little boy back from the road, saying (roughly) that in principle, we wait for the green light. At this time, a young man my age approaches us from behind and hesitates a moment for a long-enough break in traffic to cross against the red pedestrian signal. I momentarily thought about crossing myself, and I’m certain the woman gave me, a young student not unlike the guy who crossed ahead of us, a questioning look for having stayed back despite the lack of cars. But as I thought back to the German persons comment and listened to the woman repeat to the boy that “on attend le vert”, I knew that in that moment I had decided I would try to reenforce the positive lesson that the boys guardian was trying to instill for his safety, rather than be another example of “Do as we say, not as we do,” that all children (and later, teenagers) despise in the adults around them. It was fairly insignificant, and I don’t even know if the boy noticed that I didn’t walk until the little green man did, but it certainly gave me something to think about today. Thoughts or opinions? Comment below! The Champs Elysées in Paris. 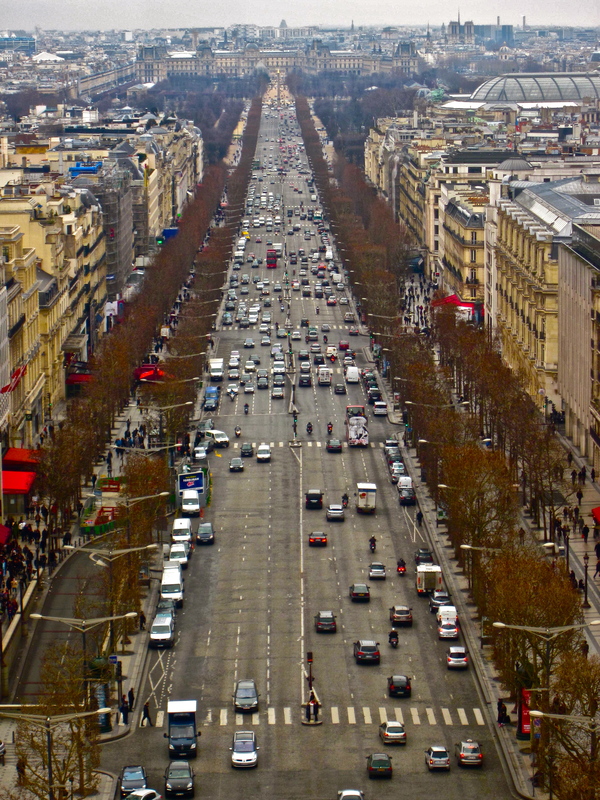 Viewed from the Arc de Triomphe. Taken in February 2012. This entry was posted in Life on Exchange and tagged canada, culture, france, germany, Life. Bookmark the permalink. Very astute. The world would be a better place if everyone did one good deed or set one good example each day.